Immerse yourself in nature. Enjoy a daily yoga practice with panoramic views that fill your vision in every direction. Nourish your body with wholesome food and allow yourself that well-deserved me-time. 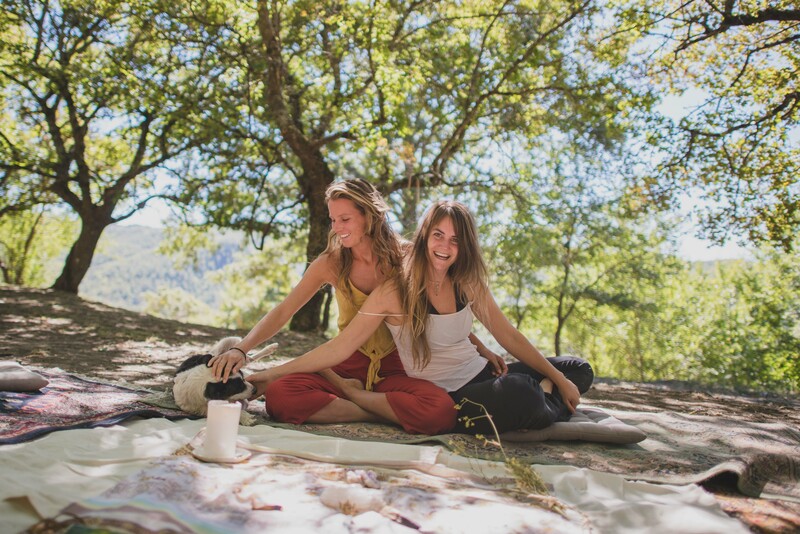 Our Relax & Reconnect Yoga Retreat will help you to harmonise body, mind & spirit and rejuvenate your whole being. Disconnect from your daily grind as you enjoy daily yoga & meditation classes, delicious, healthy meals and endless serenity. 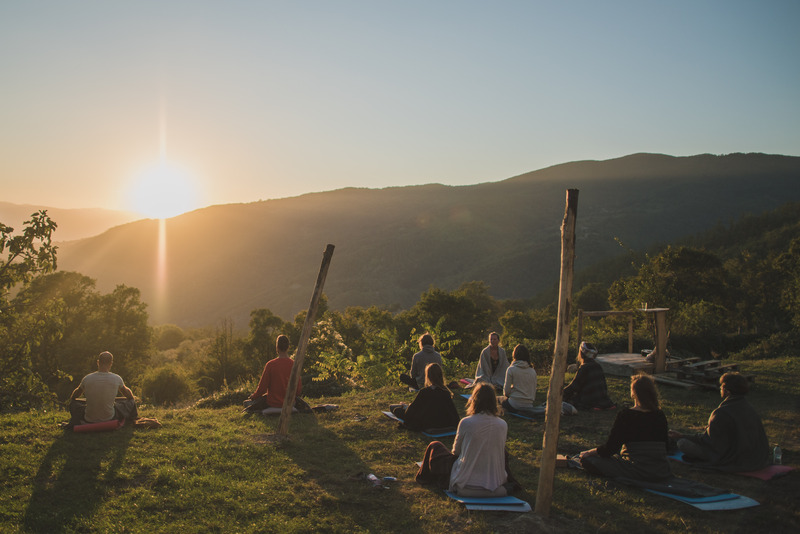 Feel your thoughts subside while meditating on top of tranquil Tuscan hills. Have a taste of ‘La Vita Bella’ with culinary cucina made with local and seasonal ingredients. 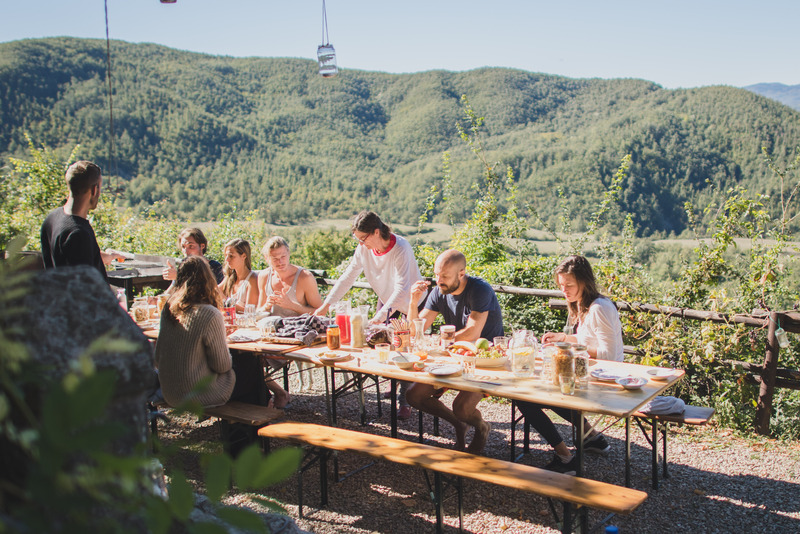 Think healthy salads, pasta, cheese and – if you like – a glass of organic, Tuscan wine. We offer an authentic experience that will make your soul sing. Picture yourself floating blissfully in an infinity pool with an infinite view overlooking the valley. If you feel adventurous we will guide you on a silent hike through a magical fairy forest to the monastery of La Verna – that optional massage will feel even more rewarding upon your return. We’ll seal each day with shared dining over communal tables while you enjoy the company of like-minded souls. Novanta is one of the most unique places Italy has to offer. A place that cannot be expressed in words, but has to be experienced to reveal its full glory. Tucked away in the luscious green hills of Tuscany, this old ruined village truly is a feast for all senses. The crew is incredibly attentive and will do their utmost to make your stay unforgettable. To become fully present we encourage you to limit your screen time during this retreat. Dare to leave the outside world behind and take the time to observe what is really going on inside. We invite you to go on this inner journey with us. All levels of yoga experience are welcome. Optional treatments to book are massages and acupuncture sessions. We welcome you on the 4th of May with a lunch at 15:00. We will finish after breakfast on the 9th of May. Emma’s exploration along the path of self-enquiry started with a journey around the globe in 2011. These travels guided her to India, a place that became a second home over the years and where she trained to become a yoga teacher. A few years ago she completed a 200hr multi-style teacher training, followed by a completion of a Yin TTC and further specialising in Prenatal yoga. You will find her classes to have a strong emphasises on going within and exploring the self, using asana and breathwork as a vehicle to see what’s really happening inside. Her classes will invite you to face and sometimes challenge yourself, but always with a strong sense of compassion and never to the extent of pushing too hard. Yoga is not about getting deeper into certain poses. It’s about going deeper within, looking into your soul. A lifelong journey with one destination: your true self – or in other words: home. The nearest airports are Florence, Pisa and Bologna. We will send you a recommended flight after booking. We can also arrange an airport pick-up to the accommodation. Right now tickets go for €60 to €105 depending on if you are travelling from Amsterdam or Eindhoven. Can’t make it in May? Don’t worry, we’ve got you covered!